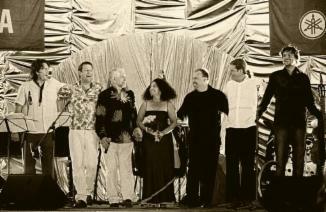 Cutting edge Anglo-Russian contemporary jazz, fusing the aesthetics of the jazz, folk and classical music traditions. Elegant, passionate, beautiful and dynamic trio sounds from an innovative ensemble of high class multicultural composers and improvisers. ‘Sheer sonic seductiveness’ (The Vortex). Nick and Leonid Vintskevich have a long-standing creative relationship Steve Kershaw. Just after the turn of the millennium Steve’s critically acclaimed Stekpanna trio found themselves jamming with the Vintskeviches at a Jazz Festival in Finland, and the deep mutual admiration of that night grew into an ensemble that is now very comfortable improvising in front of a packed concert hall or in an intimate jazz club, savouring Russia’s finest vodka after the show, or enjoying a friendly game of cricket in the English countryside. After his debut tour to Russia in 2001, Steve was invited onto Alyn Shipton’s Jazzmatazz programme on the BBC World Service to talk about Russian jazz and his experiences on the road, while Leonid and Nick first visited England as part of Oxford Contemporary Music’s ground-breaking Russian Music: Past, Present and Future series. Since then various incarnations of the group have headlined the Hermitage Jazz Festival in Moscow, played in London’s Purcell Room and Steinway Hall, appeared at Yasnaya Polyana at the personal invitation of Count Vladimir Tolstoy, and sold out the historic Rachmaninov Hall of the Moscow P. I. Tchaikovsky Conservatory. 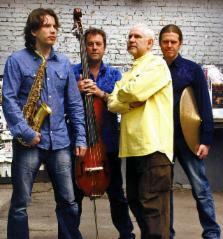 The group also appeared as the featured artists in the audiophile magazine Audio-Video, which means that 50 000 copies of their Songs From the Black Earth CD have been distributed all over Russia, and as the front cover feature of the June 2008 edition of Russia’s premier jazz magazine Jazz.ru. Their first collaborative album, NOTES FROM UNDERGROUND, issued on Flat Five Records in 2002 was lauded as 'contemporary jazz of the highest order' (Jazz Views). The second release, SONGS FROM THE BLACK EARTH (2008), was recorded in the beautiful Jacqueline du Pré Music Building at St Hilda’s College, Oxford, and the Holywell Music Room, which is Europe’s oldest purpose-built concert hall, and whose exquisite acoustics have hosted ground-breaking music since Handel performed there. 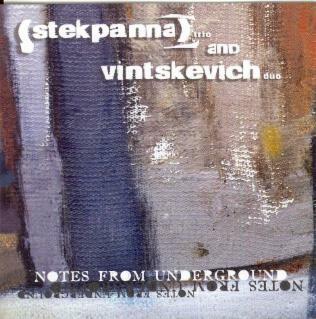 The recording showcases ‘quiet, folk-inflected, elegant music thoughtfully addressed by a tastefully restrained band that […] prides itself on purity of tone […], emphasising the beauty and shape of the pieces' affecting melodies […] The Vintskevitches (Nick the flawless saxophonist, Leonid the versatile pianist), UK bassist Steve Kershaw and Swedish drummer Petter Svärd concentrating, above all else, on sheer sonic seductiveness.’ (Chris Parker, The Vortex). The trio’s recent album UNDER A DIFFERENT SKY was one of Jazzviews’ Albums of the Year in 2016. Critics variously described the music as ‘astounding … exhilarating ... wonderful … impressive … attractive … striking [and] totally amazing’, and noted the ‘passion … inspiration … versatility and virtuosity’ of the performers. The recording also entered the Europe Jazz Media Chart as one of the 13 albums most listened to in European Jazz publications' editorial rooms in March 2017. In addition to the core Vintskevich-Kershaw-Vintskevich line-up, there have been configurations involving Kim Nazarian of the New York Voices, Jay Ashby (Paul Simon's musical director), drum ace Joel Taylor (Alan Holdsworth, etc. ), and British stars Ed Jones and Steve Waterman. But whatever the exact line-up of the ensemble, the group’s music draws its inspiration from a unique combination of jazz, folk and classical musical influences. At the heart of it all is the strong atmosphere of the Black Earth, the chernozem, Russia’s famous soil, ‘more valuable than oil, more precious than gold’, mixed with engaging elements of quirky English humour, anarchism and style. Between them Leonid, Steve and Nick have played with some of the world’s finest exponents of the jazz idiom (Lionel Hampton, Slide Hampton, Elvin Jones, Evan Parker, Jamie Cullum, Bill Champlin, Eric Marienthal, etc), and at some of the most prestigious venues and festivals: the North Sea Jazz Festival – Holland; the Lionel Hampton Jazz Festival – USA; Havana Jazz Festival – Cuba; London Jazz Festival – England; Ronnie Scott’s Club – England; Hermitage Jazz Festival - Russia; Jazz a Vienne – France; and many others. Kershaw/Vintskevich collaborations have also been featured as ‘Gig of the Week’ four times in the British newspaper The Guardian. 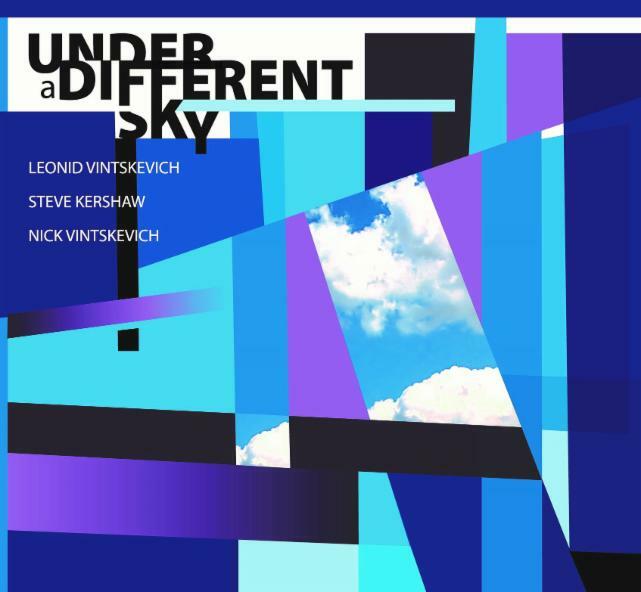 Leonid Vintskevich was twice Solo Pianist of the Year in the Soviet Union; Steve Kershaw graduated from the Bass Institute of Technology in Los Angeles as Outstanding Student of the Year in 1996; Nick Vintskevich was the winner of the 2014 Jazzrock TV Miles Award in the ‘World Fusion’ category for his two CDs Russian Ornament and Never Was A Doubt. Under a Different Sky and Songs From the Black Earth is available on SLAM Records or for digital download from eMusic or iTunes. Notes From Underground is difficult to find since the financial crisis caused the sad demise of Flat Five Records. Dreams of European union may have been straining at the seams in recent weeks, but the pan-continental sounds of jazz at Dean Clough spoke with eloquence of the power of international harmony. The band, a five-piece drawn from Scandinavia, Russia and, yes, Halifax, revealed a cosmopolitan variety both heartwarming and invigorating to a healthy audience braving the latest round of storms. Fortunately this musical typhoon only set the pulse racing with local bassman Steve Kershaw laying down a deliciously firm foundation and allowing his musical mates free, and sometimes furious, rein. Kershaw is one third of Stekpanna, a trio forged when he met Swedish drummer Petter Svärd and Danish guitarist Mads Kjølby at the LA Musicians’ Institute 10 years ago. For this tour they’ve added the prodigious talents of a Russian father-and-son duo. Leonid Vintskevitch on piano has brought saxophonist Nikolai into the jazz fold and the results are impressive indeed. The younger Vintskevitch delivers passing impressions of Sanborn, Maceo Parker and Garbarek in torrents of irrepressible notes. Less may be more, but this reed player is content to challenge that premise for the time being. His dad, too, is an extraordinary performer, taking his seat at the keyboard and miraculously transforming the instrument from barrel organ to harpsichord, hinting at stride and ragtime, and recalling Bill Evans on the way. Figuratively speaking, Rachmaninov and jazz came together again on February 3, 2009, at the Rachmaninov Hall, under the framework of the 13th (itinerant) International Jazz Province Festival. That is when a concert was held of remarkable musicians of the Kursk quartet, directed by Leonid Vintskevitch, acting simultaneously as the festival art director. The rather unusual mix of a baroque chandelier and of sailors’ striped vests in the hall started to make sense once the jazz sounded, the music of combined styles and genres. They say that Vintskevitch, following G. Lukyanov and I. Brill, as early as the 80s, dazzled the foreign public by his Russian folklore in jazz. In the Rachmaninov Hall, in duet with his son, saxophonist Nikolai Vintskevitch, he performed his folklore-like piece (Village Music). This is something like popevka-patterned Russian folk tunes blended with avant-garde poly-tonalities and jazz rock riffs. Admirers of jazz, lovers of academic music, ‘guys in vests’ and ‘gentlemen in dinner jackets’, all equally enjoyed the show. The quartet members too were variously clad. The Vintskevitches wore black suits, whereas Steve Kershaw (contrabass) and Petter Svärd (percussions) were in casual clothing. The modern jazz music (its authors were mainly the quartet members) was represented by melodious ballads and a slashing rhythmical drive. One could see and hear that the musicians had a special liking for glissando, power chords, masterly passages, and a 32-tact ‘square’ that seldom, if at all, left the stage on that night. There was a great deal of seven step diatonicism, which is why the Nardis hemiolic theme was perceived by the audience as a hit of the show. The pianist worked away at the strings under the grand piano lead, the percussionist hissed and squeaked using symbols, the bass player pushed in the ostinatic tone with his fiddle-stick, and the saxophonist blew mysteriously into the mouthpiece. That is how, in an almost avant-garde fashion, the oriental music sounded with inclusions of Miles Davis’ enlarged seconds. That was the music which Bill Evans and his trio used back in the 60s to ‘kickstart’ the audience. The atmosphere was very emotional, without arrogance and pathos. It looks like Moscow jazzmen should give due attention to this event. It takes a rare talent to fascinate an audience of 250 people. And there were no vacant seats in the Rachmaninov Hall, which is also very telling. Stekpanna (Frying Pan) is an Anglo/Scandinavian trio whose members met in Hollywood, California, in 1995. At the time they were students at the Los Angeles Musicians Institute where each won prestigious awards. They have often gigged at the White Swan Hotel in Stratford over the last 12 years, but on Sunday evening the trio became a quintet by adding Russian jazz stars Leonid Vintskevich (piano) and his son Nicolai (saxes). Mads Kjølby (Denmark) on guitar and Petter Svärd (Sweden) on drums added international flavour, as did Yorkshireman Steve Kershaw – one of the country’s leading bass players and the band’s musical catalyst. The repertoire consisted mainly of original music composed by each member of the band, the inspiration ranging from Russian transport and u-turns to the more romantic sources of Russian/Danish girls and exotic travels. This was not really jazz out of the American song book but reflected the diverse European influences of a more folksy heritage resulting in a melodic and rhapsodic base. Just to prove the analysis completely wrong the finale was a quirky/funky rendition of When the Saints Go Marching In – I don’t know what Louis Armstrong would have thought, but he audience loved it. It is rare that one has the opportunity to view five such talented and individual musicians on the same stage and sometimes the experiment does not work as a unit, but this band achieved an inspiring level of empathy that had the audience enraptured. A gig of compelling and uplifting jazz, fine ensemble work with engaging and melodic soloing from all concerned, and humour and good fun always on the agenda. Until recently I had only heard the Anglo-Scandinavian Trio Stekpanna on CD, having reviewed a couple of their albums in this column. I was pleased, therefore, to catch up with them at Norden Farm Arts Centre in Maidenhead, where they were appearing with two Russian jazz stars; Leonid Vintskevich (piano) and his son Nikolai on alto and soprano saxes. What an exhilarating evening it proved to be. The concert was just a part of a day given over to the music. The morning and afternoon saw some 80 people attend a study course during which members of the band took their audience on a journey through various aspects of the history of jazz, with appropriate musical examples and personal reminiscences. The course members became part of the 200 or so audience for the performance. This seems an inspired way to promote an interest in jazz! Stekpanna are a contemporary jazz trio, who draw on their inspiration from jazz-rock, folk and other idioms in addition to the more straight-ahead styles and with the band enhanced on this occasion (and on other gigs) by the Russians, the programme produced many surprises and a clear indication that each individual was of international stature. Apart from Duke Ellington’s In A Sentimental Mood all the numbers played were written by band members. They got the audience on their side with a great opener, Pep’s Home, in which the blues inflected sounds of Danish guitarist Mads Kjølby stood out. Memories of my own train ride overnight many years ago from Moscow to (as it then was) Leningrad came flooding back with the expressive Moscow Night Train. I had enjoyed this number when I reviewed the Trio’s CD "Starlight Barking". Composer Petter Svärd from Sweden laid down a superb rhythm on drums and with the addition of the Russians, especially the soprano sax, it took on a new dimension. North Oxfordshire's Steve Kershaw on bass provided a solid pulse for the band and added some top quality solo contributions including his composition Waltz of the Young Turks. Also from the above CD, The Tone, The Whole Tone, and Nothing But The Tone uses a musical device favoured by Thelonious Monk and is one of those catchy numbers (from the pen of Svärd) which haunts you for days after hearing it. The varied programme included an exercise in 5/4 time in which Vintskevich senior instructed the audience in clapping to the rhythm during Give Me Five. The Russians performed as a duo on a rather haunting Village Music which built up a tension only to simmer down again, and the whole band played their version of Britney Spears’ Toxic - not a tune we were expecting to hear! In response to the audience's call for an encore we were treated to a rather unique interpretation of When The Saints Go Marching In. Last weekend three events started this season of Russian Music Past, Present & Future: a jazz concert, a film and a concert of post-Revolution classical music. Notes from Underground, a project incorporating Stekpanna, an Anglo-Scandinavian trio, and three of Russia's best jazz musicians, was a thoroughly uplifting experience. David Goloshchokin played a selection of his own tunes and those of Duke Ellington. He kept hanging on to the notes of his electric violin - leaving you wondering if one will end before the next starts. Or being surprised when one finished before you thought it should. Or those long high slow sensual notes that kept going, up and away until they disappeared, becoming part of the atmosphere, as a vapour trail. There appears to be only one person in Steve Kershaw's life on stage, his double bass. Even between numbers he has his arm around it in a pose reminiscent of young lovers in the park, gently moving forward, nowhere in particular, but the arm of the boy slung over his girl's shoulder. 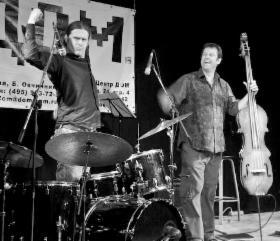 If Kershaw's playing is the epitome of horizontal jazz performance, then Mads Kjølby Olesen is the vertical. A tall man, his whole body tensed with every pluck of his guitar strings, his neck taking on Cardassian proportions as the muscles tightened wringing out every note. Petter Svärd, with a look and presence that suggested Rivendell, achieved that rare thing with drummers in the Jacqueline du Pré Music Building, a presence sans overbearance. Where the first set was bright and bouncy, the second, with father and son Leonid and Nikolai Vintskevich, was darker, but full of colour. Peppered with references to Russia's musical heritage, the music pulled you into a narrative that you did not need to understand to feel it. Despite the differences between the two sets, there were some points of touch, not least the sheer enjoyment everyone had in performing - especially the tension that came from each testing the other, pushing them on further and upward. All six planned to retreat to the recording studio the next day, and let us hope that there will soon be a CD. This Anglo-Russo-Swedish quartet first met in Finland in 2000, jammed, gelled, formed a band, then recorded this album of European jazz/ethnic music in three sessions (two of them live) in Oxford between 2005 and 2007. The title comes from an Osip Mandelstam poem, and their chief inspiration from the same source as Mandelstam's: Russia's fertile and beautiful black earth region, centred on Voronezh. Saxophonist Nick Vintskevitch wrote most of the material, quiet, folk-inflected, elegant music thoughtfully addressed by a tastefully restrained band that probably prides itself more on purity of tone than on jazz-based propulsiveness, emphasising the beauty and shape of the pieces' affecting melodies rather than their various rhythmic possibilities. This is not to say that there are no passages of robust intensity or even fierce interplay in compositions such as the plangent opener 'Alone', or the quartet's intriguing visit to the traditional New Orleans staple 'When the Saints Go Marching In', just that to considerable effect the band's priorities lie elsewhere, the Vintskevitches (Nick the flawless saxophonist, Leonid the versatile pianist), UK bassist Steve Kershaw and Swedish drummer Petter Svärd concentrating, above all else, on sheer sonic seductiveness. Songs from the Black Earth, shows Stekpanna's poised, spacious grooves and understated musicianship to be the perfect setting for the Russian duo's wistful, folk-inspired melodies. For there is a storm hidden in the abyss of your calmness. And while you admire the beauty of the sky, you shiver for it. These words may well sum up the general mood of Songs from the Black Earth: the calmness is just the surface, through which at times the true passion breaks through. In the very first piece (the author is mostly Vintskevitch Junior), Alone, at the very end of the first solo (with Nikolai playing the soprano sax) one can hear the stubbornly recurring, almost folksong tune, typical for a Russian zhaleyka, although the piece was composed in the state of Idaho: " Limitless space ... Monotonous roads... Always snowing ... This was so like our Motherland... Solitude ..." says the author. The second piece seems to belong to another world. It is called Jacqueline du Pr. A concert hall in Oxford where the Vintskevitches performed was given the name of this great English cellist with an aristocratic French name. However, that is a lyrical note with a bit of sadness in it. Which is no wonder. A student of Rostropovich (whom he talked out of taking part in the Tchaikovsky competition), she died at the age of 42, having spent 14 years of her life in an invalid chair with an incurable disease -multiple sclerosis, and in a rather complicated family situation (she was supposed to be married to an outstanding pianist and conductor Daniel Barenboim). 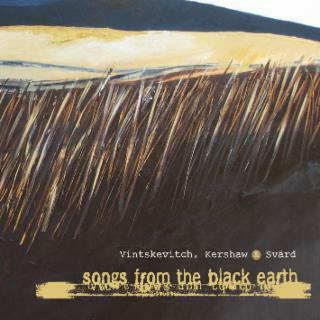 The titular Song from the Black Earth is an ascetic ballad telling us what is common about the earth of Kursk and England. Or maybe Scandinavia too: not only the soil of course, but what is known as the Nordic spirit. Especially since Vintskevitch Junior has long left the southern Kursk and now resides in the capital of Russia, where wild bears are still to be met in the snow-covered streets, according to the gossip still circulating in the West. As a matter of fact, musicians like the Vintskevitches, with their international ties and the " Jazz Province" Festival, have made the people abroad realise that these are the myths. However, is art ever possible without myths? In the 50s, for instance, we danced rock 'n' roll to the Afro-American spiritual When the Saints go Marching In. Lembit Saarsalu, an old-time partner of Leonid Vintskevitch, reminded us of that fact, having played this hymn in a cheerful Afro-American funky style for his 2 x 2 = Labayalg record. The quartet made up of two Russians, an Englishman and a Swede also goes back to what is kept in the genetic memory of Jazz - dance as a spiritual form of art (as a theologian from the Netherlands once wrote, " after all, marches is a dance, too"). Please note the reserved manner (even compare to the Estonians, let alone the African-Americans) in which Petter Svärd accompanies the alto sax of Nikolai Vintskevitch. Village Music is a very avant-garde, so to say, that is between Errol Garner and Cecil Taylor. [Down Beat, the oldest but still rather influential jazz magazine, described the duo of Leonid Vintskevitch and Lembit Saarsalu (Estonia) as the ‘beautiful Russian open-ended avant-garde where Errol Garner does not conflict with Cecil Taylor’]. Without quoting any Russian folk songs, Leonid Vintskevitch "prepares" the grand piano in such a way that went the keys are pressed, the strings produce something like the faraway strumming sound of an almost forgotten balalaika or domra, and this strumming, just like the Zhukovsky's sea, is hiding a truly boisterous life under the surface - and nonconventional but still piano-based boogie-woogie. "It is the sources of this music, the true folklore that so fascinated Igor Stravinsky during his ‘Russian’ years”, explains the pianist Vintskevitch. Which is true: not that far away from the Kursk region is the little town of Ustilug (now lying in on the Ukrainian-Polish border), where the great Russian composer Igor Stravinsky spent every summer as a teenager, and where he absorbed, both literally and figuratively speaking, the atmosphere of the Slavonic musical folklore. While it was Prokofiev, that Vintskevitch Senior played in the final exam at the Kazan Conservatory, the paradoxical Stravinsky is initially much closer to him. In a word, it’s the traditions … The sixth track is Holywell Street. It is the name of the street in Oxford, where one of the oldest English concert halls is to be found, the one that has seen Haydn and Handel. "The desire to be in this hall and perform there is unparalleled ..." No comment. Pep's Home is a dedication to Pep Peters from Salt Lake City, a friend of the Vintskevitches. "This is a home that has its own studio and, what's most important, an excellent collection of jazz records and books." Perhaps that is why this is the only number which every fan of jazz mainstream and even blues accepts as his or her own. Indeed, jazz has long become the same type of an international art as the cello concertos of the British musician du Pre or the quartet of the father and son Vintskevitch, Steve Kershaw of England, and Petter Svärd of Sweden. Certainly these tracks convey a sense of the wide open spaces of Russia (the home of the "black earth" of the title). Leonid Vintskevitch's piano tone is beautifully lucid. His delicate touch makes every note count. [In] When the Saints Go Marching In, where the old trad warhorse is brushed down thoroughly to provide a jovial tongue-in-cheek interpretation which displays the quartet's ironical humour as well as its musical expertise, Nikolai's supple solo is followed by a superbly adroit piano solo from father Leonid and a lilting drum solo from Petter, all underpinned and held together by Steve Kershaw's double bass. Village Music again has lots of ostinato figures from the piano but it conveys the carefree (sometimes wild) atmosphere of a village dance. And Leonid's piano is amazing: playing the piano strings as well as its keys, and creating his own dazzling counterpoint between left and right hands. Holywell Street (presumably dedicated to an ancient thoroughfare in Oxford, where the group has often performed) is a piece which flows lyrically. The bass and drums are well in evidence on Pep's Home, a catchy piece with beboppish bluesy overtones. The closing Untitled Encore is another meditative piece which benefits from Nick's sax and Leonid's fluent piano. This album proves that the players are all masters of their instruments, with praise most deserved for the astonishingly gifted pianist Leonid Vintskevitch and the utterly dependable bassist Steve Kershaw. Let's hope their next album is recorded "live" - to capture the excitement they generate when giving concerts. This engaging album combines the Stekpanna Trio (a Dane, a Swede and a Yorkshireman) with the father and son Vintskevich duo from Russia on piano and saxophones. The music is loose limbed and freewheeling, the two groups seizing jazz's swinging centre of gravity and comfortably co-existing within each other's musical value system, so projecting an integrated group sound. The two groups played a series of UK gigs in May 2002, culminating in an Oxford Contemporary Music concert and the following day this album was made in five hours. Opening with 'Autumn Song,' a Vintskevich duet, Nikolai on soprano saxophone demonstrates a dark melodicism that hints at Russia's great folkloric heritage while Leonid's touch on piano makes every note sing. A rhapsodist at heart, their styles point to the high standard of technical accomplishment of many Russian jazz musicians. The same melancholic flavours of 'Autumn Song' resurface in the reflective 'Nina,' this with the full ensemble, while in contrast the 'Give Me Five,' as you might expect in 5/4, presents a sort of Euro-Russian hoe down. Che il jazz europeo abbia avuto una sua evoluzione parallela a quello che i colleghi americani fanno sull´altra sponda dell´oceano è ormai un dato di fatto, confermato non solo da grossi nomi come Jan Garbarek o John Surman, ma anche da incisioni come questa, in cui un collettivo cosmopolita, con musicisti provenienti da Svezia, Russia, Inghilterra, celebra delle melodie scritte per lo più dal sassofonista Nick Vintskevitch e che provengono dall´ampio patrimonio culturale europeo. Sono atmosfere calme, controllate, sospese in un area fluttuante e che si avvolgono sull´ascoltatore, specie quando è in azione il sax soprano. C´è uno standard famoso: "When the Saints Go Marching In" interpretato a modo proprio, mutato in un qualcosa di nuovo. Si muovono tutti insieme in esecuzioni collettive ben rodate raggiungendo un vertice nel titolo che dà il titolo al disco. Alcuni brani sono in duo, il sassofonista insieme al pianista Leonid Vintskevitch. Anche qui si raggiungono accenti poetici intensi. A completare il gruppo ci sono il batterista Petter Svärd ed il contrabbassista Steve Kershaw. La loro esperienza fa sì che si evitino situazioni troppo palesemente ispirate ad accenti foklorici. Sono dei musicisti colti e non ne fanno mistero, rendendo il tutto un lavoro complesso nonostante l´apparente semplicità. Anzi, fanno di tutto per non farlo notare. Tutto scorre compatto, una cinquantina di minuti che invitano ad ascoltare con tranquillità ed a lasciare da parte i rumori del mondo esterno.